Don’t know what new side to come up with on turkey day? 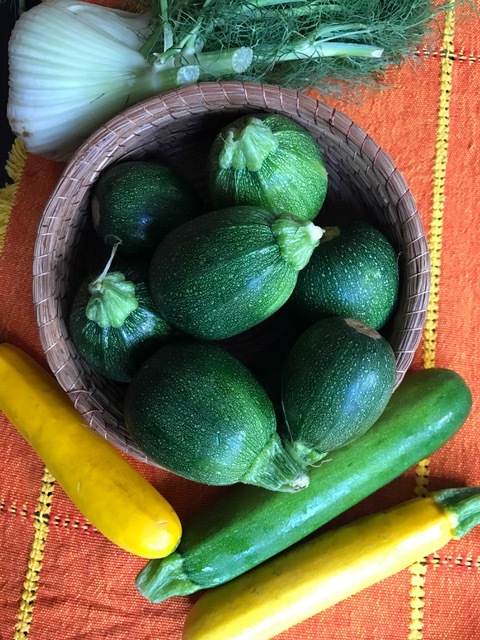 This year, you can pair Grilled Zucchini, Yellow Squash & Fennel with turkey or ham. And – without carbs you can enjoy a second or third serving. Just make sure to indulge in more wine or bubbly! 2. Then, working on a cutting board, trim tops and bottoms of zucchini and/or yellow squash. 3. Cut the zucchini and/or yellow squash into 1/4-inch thick rings or circles; set aside. 4. Cut the fennel bulb into 1/4-inch thick slices (vertically); set aside. 5. Line an 18 X 12-inch baking sheet with parchment paper or aluminum foil. 6. Using a basting brush, lightly oil the lined baking sheet. 8. Lightly brush the zucchini/squash and fennel slices with olive oil; sprinkle with salt and ground black pepper. 1. Set the baking sheet on an oven rack set 6 to 7 inches below the top “broiler” element of oven. 2. Broil or grill the vegetables for about 7 to 9 minutes on one side or until they are golden brown and look grilled. 3. 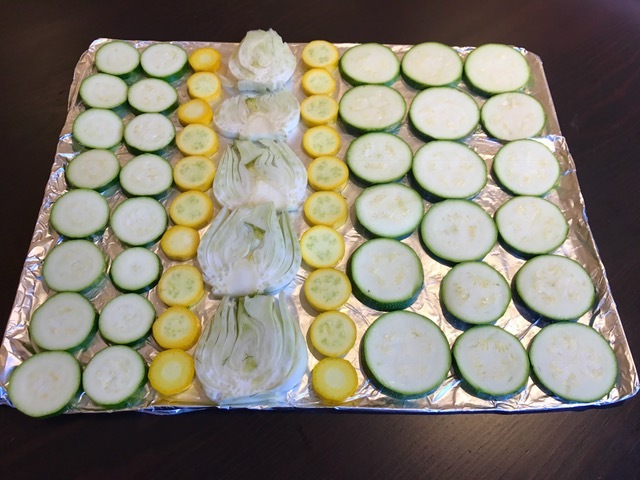 When vegetables look grilled, transfer the baking sheet to a counter or a trivet. 4. Using tongs, carefully turn over the vegetable slices; lightly brush the vegetables with olive oil. Sprinkle with salt and ground black pepper. 5. Return the baking sheet with vegetables to top oven rack; broil the vegetables for 7 to 9 minutes or until they turn golden brown and look grilled. 6. When vegetables are done, transfer the baking sheet to a counter or trivet. Transfer the vegetables to an ovenproof serving platter (arrange them decoratively). 7. Garnish the vegetables with rosemary and fresh mint sprigs. Serve immediately. 8. Alternatively, this dish can be prepared a few hours in advance of a meal. If making this ahead: when vegetables are done, transfer them to an ovenproof serving platter without the rosemary and mint sprig garnish. 9. About 30 minutes before serving dinner, cover the vegetables with aluminum foil; warm in a preheated 350°F oven for about 25 minutes. Serve immediately. Every year in central and southern Mexico, the Day of the Dead is traditionally celebrated on November 1 and 2. Although this holiday coincides with the Roman Catholic Church’s All Souls Day and All Saints Day, indigenous cultures have fused the Church’s celebration with the ancient custom of honoring their departed ones. Memorial altars are erected with photographs of the dead and what used to be their favorite foods. 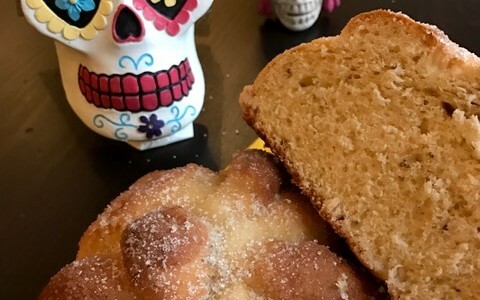 Local bakeries sell Pan de Muertos or Day of the Dead Bread. This sweet bread is made with eggs, anise seeds, flour, sugar and yeast. The loaf is usually round, adorned with dough that is shaped to resemble bones. Although the ingredients are basic, the flavors and texture of this bread literally melt in your mouth! 3 to 3-1/2 cups all-purpose, unbleached flour. 1. In a small saucepot, combine the milk and water; heat until mixture is lukewarm. 2. Place the yeast and lukewarm liquid in a metal bowl or a small, separate metal saucepot; cover and set aside (on a wood or plastic surface) for 13 minutes. 1. After 13 minutes, the yeast mixture will look puffy – transfer it to a 2-quart mixing bowl or a stand mixer fitted with a bowl. 2. Stir in the eggs, butter, sugar, vanilla, salt and anise seeds. Beat on low until mixture is barely uniform. 3. With electric beaters on low, stir in 1 cup flour at a time, until a sticky dough has formed. 4. At this point, clean off the beaters. Using a wooden spoon, add 1/4 to 1/2 cup flour until the dough amalgamates and becomes a little firmer (not hard). 5. Flour your hands and the dough (lightly). 6. Transfer dough onto a lightly-floured board. Knead dough until it is smooth and elastic. 1. Oil a clean, 1-1/2 to 2-cup mixing bowl with vegetable oil. 2. Transfer dough to the oiled bowl; cover with aluminum foil and set dough to rise on a wood surface or in a cold oven with door closed. Let dough rise for 20 minutes. 3. After 20 minutes, transfer dough to a lightly-floured surface and punch it down. 4. Remove a 5-inch piece of dough from the dough ball. 5. Shape the largest dough ball into a flat round form and place it on a parchment-lined baking sheet measuring 16 inches by 11 inches. 6. Take the smaller dough ball and pull off 4 to 5 walnut-sized pieces. Roll each piece out to about 4 to 5 inches. 7. Place one rolled dough piece going from the top center and down the sides of dough round on parchment-lined baking sheet. 8. Add the remaining rolled dough pieces in a similar way and evenly spaced all around the dough round. 9. Shape a round knob on top center of the dough round. The rolled dough pieces will look like long bones on the bread. 10. Set dough to rise for 30 minutes on a wood surface or cold oven with door closed. 1. After 30 minutes, transfer the baking sheet with dough to a wood surface; set aside while preheating oven. 3. When oven is preheated, place the baking sheet with risen dough on a rack positioned in center of oven. 4. Bake the bread for 10 minutes. 5. After 10 minutes, lower oven temperature to 350°F; bake the bread for an additional 10 to 15 minutes or until it looks golden brown. To test doneness: insert a pointed knife in center of bread. If knife comes out clean, the bread is done. If not, bake for an additional 5 minutes and test once more. 6. Transfer baking sheet with bread to a counter to cool. 1. When bread is completely cool, place 1/4 cup sugar and the orange juice in a small saucepot and heat until the sugar melts. 2. Let the orange juice-sugar glaze cool completely. 3. Using a basting brush, glaze the bread. Sprinkle the bread with remaining sugar. 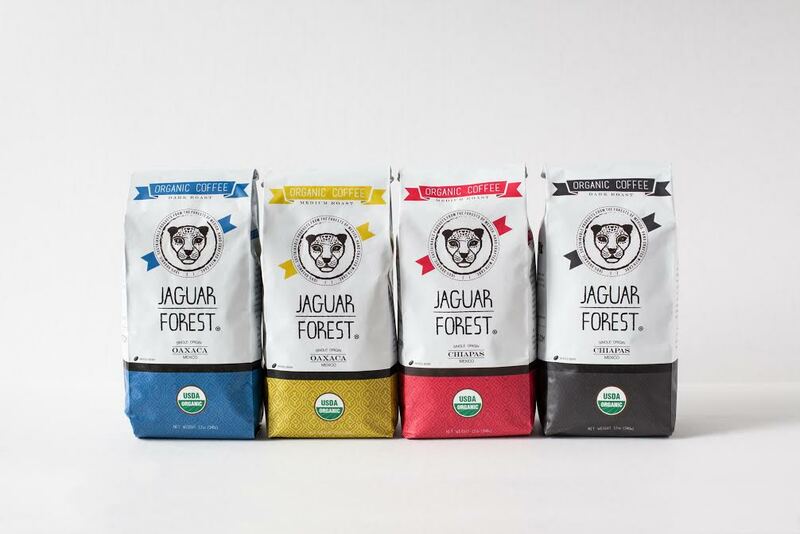 Enjoy Day of the Dead Bread with the best Mexican coffee on the market -Jaguar Forest® Organic Coffee, sold at Erewhon supermarkets in Los Angeles, Venice and Calbasas, California; and also at Vicente Foods, Los Angeles; Rainbow Acres, Culver City and Marina del Rey, California. These delicious cookies are from Mexico. They’re called pastelitos or little cakes. I think they look like Easter eggs. Hence, they’re a perfect dessert for Easter Sunday. Everyone will love the flaky texture and buttery-cinnamon flavors of these melt-in-your-mouth Easter cookies! 2. Sift flour, cornstarch and cinnamon into a 3-cup bowl; set aside. 3. Line two 18X12-inch baking sheets with parchment paper; set aside. 4. In a 4-cup bowl or a stand mixer bowl, combine the butter and sugar; beat until light and fluffy. 5. Gradually add the flour mixture into the butter-sugar mixture. 6. Mix well and knead until a smooth dough forms. 7. With your hands, take a small piece of dough and shape it into a 3/4-inch ball. 8. Place it on one of the parchment-lined baking sheets. 9. Continue forming 3/4-inch balls of dough, placing them 2 inches apart on baking sheets. 10. Set baking sheets in oven and bake the cookies for 12 minutes. 11. After 12 minutes, invert upper baking sheet with bottom baking sheet; bake for an additional 12 to 13 minutes. 12. After 12 or 13 minutes, check underside of one cookie. It should look light golden brown. If it is not light golden brown, bake the cookies for an additional 5 minutes. 13. Remove the baking sheets with cookies from oven and set them on a counter to cool. 1. When cookies have cooled, set them on a serving platter, garnished with sifted, powdered sugar. 2. FOR MAKING AHEAD: When cookies have cooled completely, sore them in double Ziploc® freezer bags up to 3 weeks ahead. 3. FOR THAWING & SERVING: Remove cookies from freezer and Ziploc® freezer bags. Place cookies on a platter to thaw for 4 hours (covered with aluminum foil). When ready to serve cookies, garnish them with sifted, powdered sugar. Petits fours is French, for small ovens. In the eighteenth century, cooks and pastry makers baked miniature confectionaries or appetizers in smaller ovens, next to the main ovens. Serve these romantic Petits fours to your sweetheart on February 14th! They’re also perfect for that Valentine’s Day party, since they come in single servings. 1. Preheat oven to 350°F. Grease and flour a 13x9x2-inch baking pan. 2. In a large mixer bowl, mix butter, sugar, eggs and vanilla until fluffy. 3. Beat for 2 minutes, scraping bowl with a rubber spatula occasionally. 4. On low speed, mix in the flour, baking powder and salt alternately with milk. 6. Place pan with batter on a rack positioned in center of preheated oven. 7. Bake the cake 25 minutes. After 25 minutes, place a pointed knife in center of cake to check for doneness – if knife comes out clean, the cake is done. 8. If the knife has batter clinging to it, bake the cake for an additional 5 to 7 minutes. Check cake once more by inserting knife in its center. 9. Let cake cool in pan on a kitchen counter or a wooden board. 10. When cake is cool, cut it into 12 to 16 equal pieces. Note: each piece should measure 2 x 2 inches. Set aside on a baking sheet covered with parchment or aluminum foil. Optional: You can use color of your choice for flower decoration. 1. In a large mixing bowl, combine glaze ingredients. 2. Beat on low speed just until blended; beat on high until smooth. 3. Apply glaze evenly over tops, letting the glaze drip on sides of cakes. 4. Set the glazed cakes aside to dry. 5. When cakes are dry, place a rosette cake decorating tip on desired color icing tube. 6. Squeeze tube to create a rosette or flower in center top of each cake. 7. Place a flat-ended decorating tip on green icing tube and pipe a leaf on each side of flower on center top of cakes. 8. 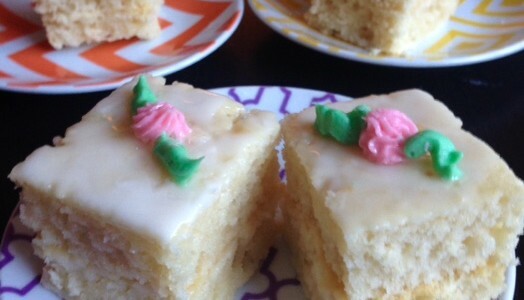 Place cakes on flattened cupcake papers set on a serving platter. 9. Alternatively, place cakes directly on serving platter. Cover with tented foil until ready to serve. These oatmeal power bars are a fun treat to make for that Halloween bash! One look at the ingredients and you’ll approve – no sugar or flour. These bars are so scrumptious and healthy that you won’t have to stop reaching for a second, third, fourth … Happy Halloween! 2. Place oatmeal in an 18 X 12-inch rectangular baking sheet. 3. Toast the oatmeal for about 5 minutes. 4. After 5 minutes, stir the oatmeal – this prevents blackening at the edges of baking sheet. 5. Toast the oatmeal for an additional 5 minutes; stir once more. 6. When oatmeal has turned light golden brown, it is done. 7. If needed, toast the oatmeal for an additional 2 minutes. Set oatmeal aside in baking sheet to cool on counter. 8. Keep oven constantly heated at 350°F. 1. In a 1-quart sauce pot, heat together the peanut butter, honey, maple syrup and vanilla until mixture is warm and runny; set it aside. 2. In a 2-quart mixing bowl, combine the toasted oatmeal, almonds, sesame seeds, raisins and salt. 3. Gently stir in the warm syrup mixture until all ingredients are combined. 4. If the mixture is too loose and grainy, add 1 to 2 more tablespoons maple syrup to combine and amalgamate the ingredients. 5. Line the baking sheet with parchment paper. 6. Transfer the oatmeal mixture to the parchment-lined baking sheet. 7. With wet hands, pat the mixture to form an 11 X 7-inch rectangle in center of sheet. 8. Using a knife, gently cut the oatmeal mass into 24 bars. 9. Bake the oatmeal bars for 10 to 13 minutes or until they turn golden brown. 10. Set oatmeal bars aside in baking sheet to cool completely. 11. When bars are cool, carefully cut through the squares to loosen them. Serve immediately or store the oatmeal bars in a glass jar in refrigerator. 12. Halloween oatmeal bars will keep, refrigerated, up to two weeks.